Playing Apex Legends on PS4 doesn't require PS Plus, but some free goodies are waiting if you do have a subscription. The new battle royale game from the makers of Titanfall has a bonus pack with six in-game customization items available now for all PS Plus subscribers, and it's super easy to pick it up and start kitting out your characters. Just head to the Apex Legends store page and you can find the Apex Legends: PlayStation Plus Play Pack in the add-ons section. You'll need to add the pack to your cart and complete the 'purchase' but you won't be charged anything - just like when you pick up your monthly allotment of free PS Plus games. Then load up Apex Legends (close it first if you already had it open) and your items should be waiting for you. Rock these shape-y blue looks and people will know exactly how pleased you are to be playing Apex Legends on the PlayStation 4 computer entertainment system. 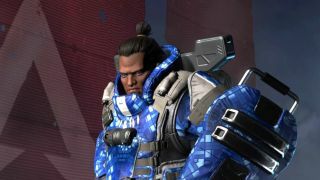 You'll likely get a chance to show them off to players on other systems when Apex Legends' cross-platform plans bear fruit, though Respawn has made cross-progression sound less likely. In other words, you probably won't be able to unlock PS Plus gear on PS4 then log into the same account on PC or Xbox One and keep using it, no matter how rebellious it would feel.